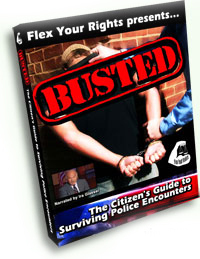 Created by Flex Your Rights and narrated by retired ACLU director Ira Glasser, BUSTED realistically depicts the pressure and confusion of common police encounters. In an entertaining and revealing manner, BUSTED illustrates the right and wrong ways to handle different police encounters and pays special attention to demonstrating how you, the viewer, can courteously and confidently refuse police searches. The information on this DVD is invaluable and more and more everyday. At least until the laws change more.